Boeing (NYSE:BA) stock came under pressure recently after it was announced that an automated flight software glitch in its planes caused both the Ethiopian Airlines and Lion Air crashes. As a result, the Federal Aviation Administration (FAA) issued an emergency order to ground both the 737 MAX 8 and MAX 9 planes. Due to the grounding of its 737 MAX airplanes, Boeing had fewer aircraft deliveries during the first quarter. Company management reported that it delivered only 89 of the 737 airplanes, down from 132 planes in the first quarter of 2018. Total orders slipped to 91 airplanes, down from 180 in the same quarter a year ago. Now, I expect we’ll gain even more clarity on how the 737 MAX grounding impacted Boeing’s top and bottom lines next week. Boeing is due to release its first-quarter results next Wednesday, April 24, before the stock market opens. Clearly, the drop in first-quarter orders will weigh on the company’s earnings and sales. As a result, the analyst community revised their first-quarter earnings estimates lower. The consensus estimate now calls for earnings of $3.59 per share on $23.95 billion in revenue, or 11.1% annual earnings growth and 4.6% annual revenue growth. So, is this a “buy the dip” situation? Or is it time for investors to disembark? Let’s run Boeing stock through my Portfolio Grader and Dividend Grader to see. We’ll start with the company’s fundamentals. Now, as you can see, there is some good news here. Boeing is still achieving good sales and earnings growth (as mentioned above), as well as operating margin growth. Return on equity is quite strong. Plus, it has a strong track record of reporting positive earnings surprises. 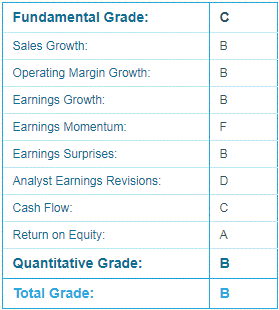 You’ll also notice that BA stock still rates as a “B” overall, which makes it a solid buy. That’s because fundamentals only tell part of the story. My Quantitative Grade actually carries a little more weight — and on that basis, Boeing stock does slightly better, with a “B” rating. This score basically tells us whether a stock has good money flow, or buying pressure. In my research, I’ve found that money flow is the single most important indicator of a stock’s long-term success. And interestingly, Boeing’s money flow has not wavered…suggesting that big institutional funds are still buying the stock. Because BA stock also carries a healthy dividend yield, let’s see how it stacks up in Dividend Grader, too. 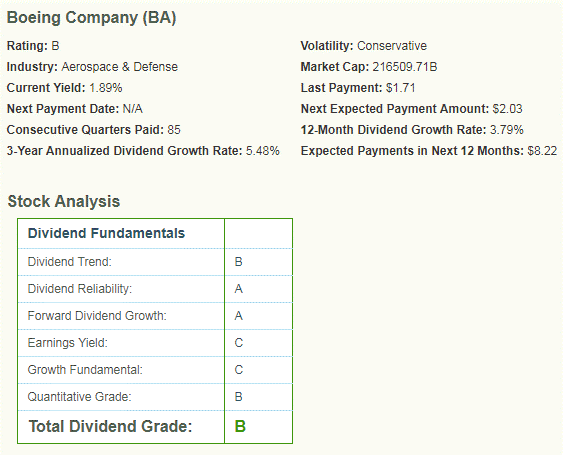 As you can see, Dividend Grader rates Boeing stock as a “B” as well. While Boeing’s Earnings Yield could be better, it has a good Dividend Trend, and receives top marks on both Forward Dividend Growth and Dividend Reliability. Now, while the B rating makes BA stock a solid buy…there are a few stocks that got an A rating — in both Dividend Grader AND Portfolio Grader. I call these AA-rated stocks “Money Magnets,” because the stock market is narrowing — and these are exactly the kind of stocks that big Wall Street institutions will be scrambling to buy. Click here to learn more about this phenomenon. When I say the market’s getting narrower, I mean exactly that: Investors everywhere are looking around at all the headlines — weak earnings, slow economic growth, turmoil in various parts of the world — and growing more selective in their stock choices. Which stocks are they buying? Well, at times like these, you’ve got to do a little better than just a hot brand or a flashy product. You need to reward investors with nice profits…and a healthy dividend. That’s what the Money Magnets are quietly delivering, time after time. Article printed from InvestorPlace Media, https://investorplace.com/2019/04/why-i-still-like-boeing-stock/.